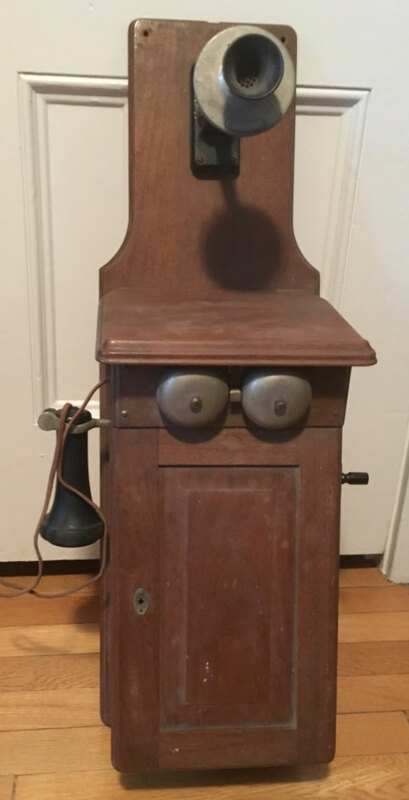 This is the telephone from Clem Emlen's "Twin Oaks Ranch" in Gilroy, California. Clement Henry Emlen (George —> George —> George —> James —> Samuel —> Caleb, b. 1877, d. 1951) bought the land for the ranch in or around 1903 after quitting his job at the Union Iron Works in San Francisco. He raised cows and other animals, and had a plum/prune orchard. 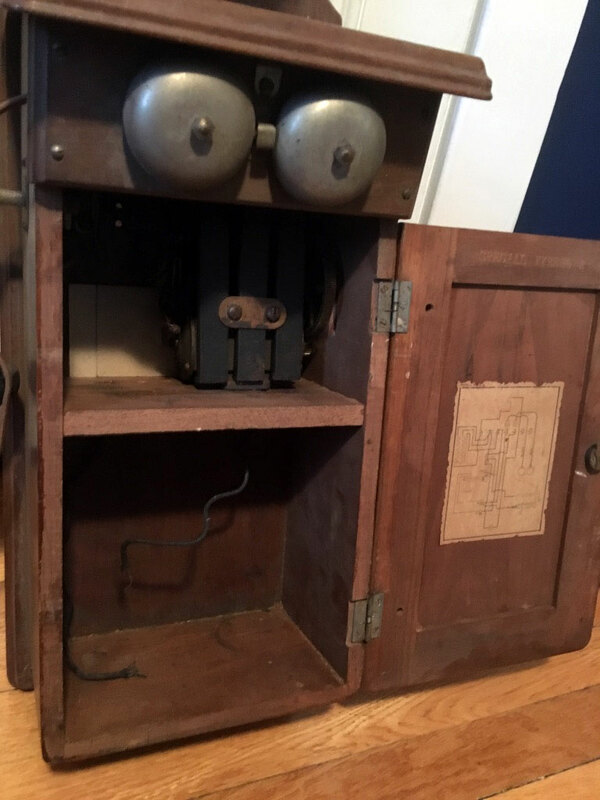 This telephone is a Western Electric Special Type 301A wall-mount telephone, also known as a "fiddleback". It has patent dates of 1891 and 1894 stamped on the side, but it was probably made around 1905. The patent stamp says: "Patented in U.S.A. Mar. 31, 1891, Jul. 17, 1894. Other patents applied for. Western Electric Company, Chicago - New York. 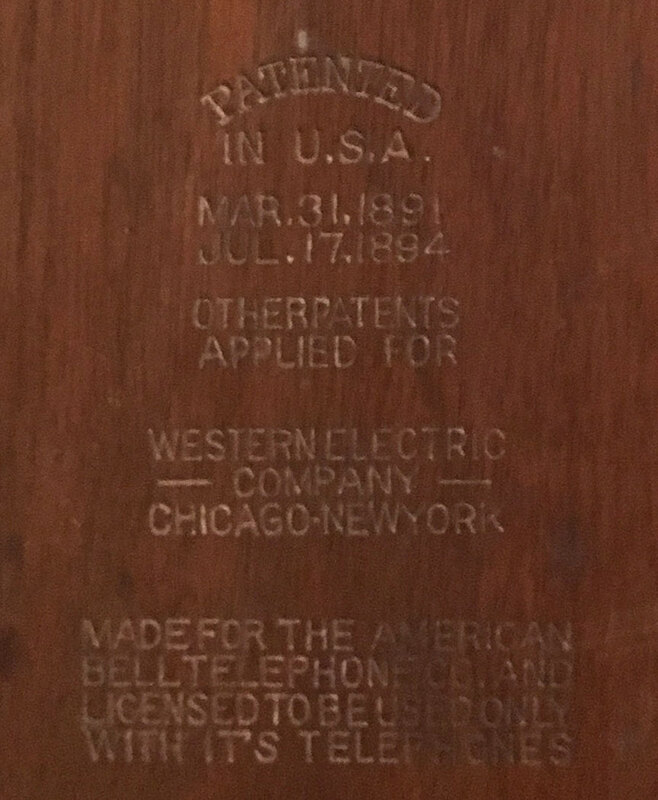 Made for the American Bell Telephone Co. and licensed to be used only with it's [sic] telephones." 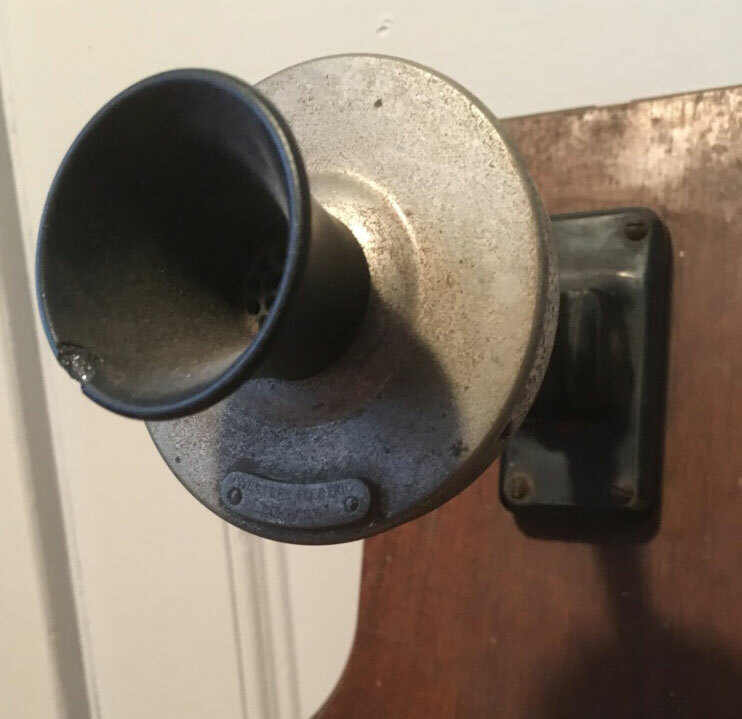 The phone has a hand crank on the right side, a receiver hook and earpiece on the left side, ringer bells in front, and the mouthpiece on top. Just below the mouthpieces is a flat surface to use when writing notes. Opening the front door of the phone reveals a compartment where the batteries would have gone. 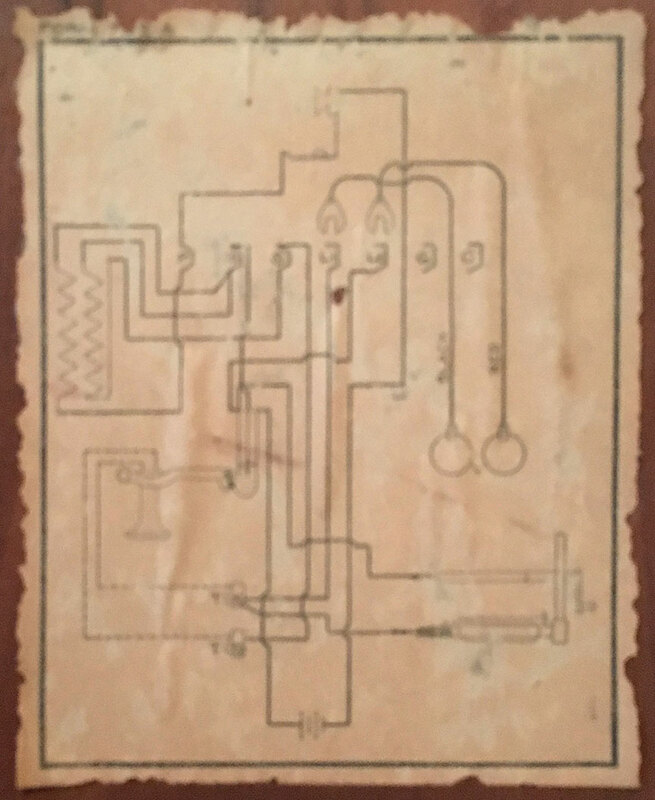 There is a circuit diagram pasted on the inside of the door. The enclosed clipping sounds a lot like our old "Farmers 24X" line which had a lot more than 10 "subscribers" as they were called. One of the favorite indoor sports was to listen in on the various conversations. One of the worst offenders was a Miss Joan Shields. 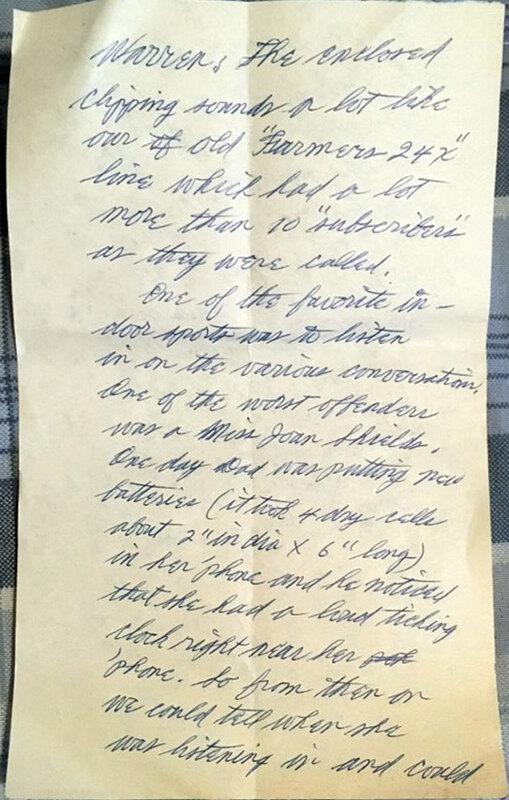 One day Dad was putting new batteries (it took 4 dry cells about 2" in diameter x 6" long) in her phone and he noticed that she had a loud ticking clock right near her phone. So from then on we could tell when she was listening in and could tell her to please hang up. Each person who listened in decreased the volume and if too many listened in you couldn't get any sound. 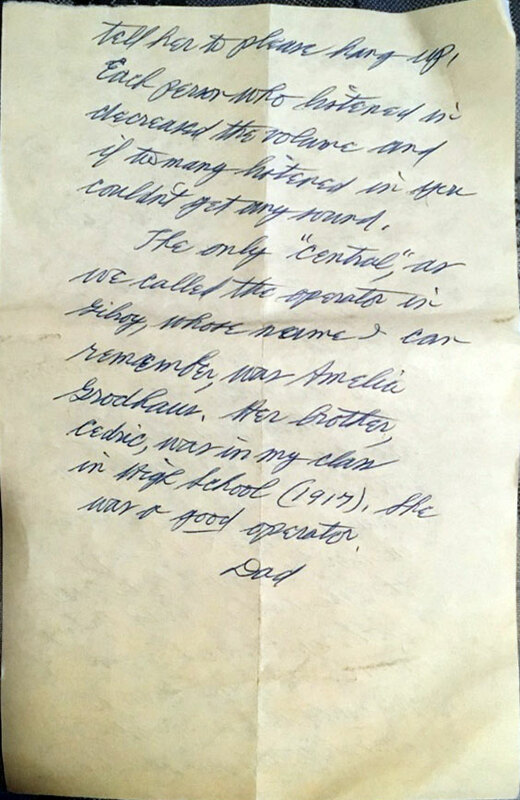 The only "central," as we called the operator in Gilroy, whose name I can remember, was Amelia Grodhaus. Her brother, Cedric, was in my class in high school (1917). She was a good operator. 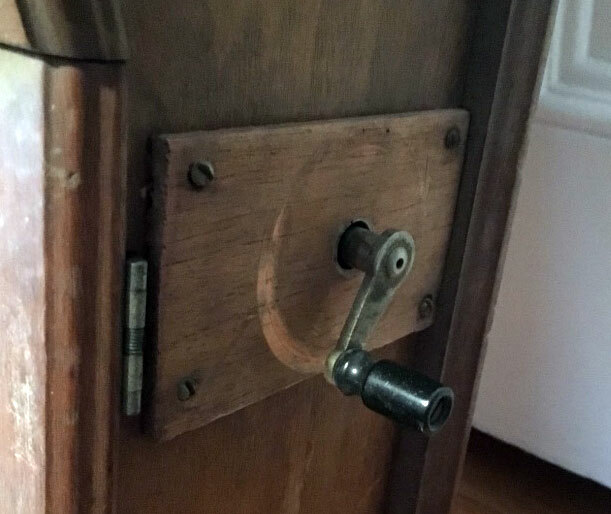 I can't remember just when this telephone was installed at the ranch except that it was before 1910. I want to go to the museum in Gilroy as I'm sure they have the records as to when the "Gilroy Telephone Co." was organized. I'll send it to you when I get the info. This was the original phone. There were a lot of people (farmers) on the one line which was strung along trees and poles for ten miles. This line was called "Farmers Line 24X, and our number was "Farmers 24X6" which meant you rang one long and six short to get us.